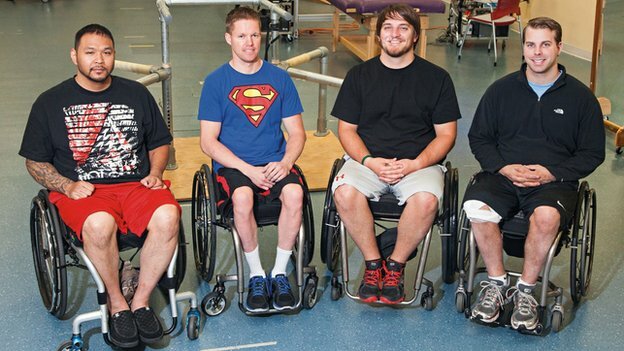 Four for Four: That’s how many patients in a study supported by National Institutes of Health have regained leg movement when electrical stimulation was applied to the spinal cord below the injury site. The first success was patient Rob Summers who was paralyzed from the chest down. Doctors implanted 16 electrodes near the bottom of his spine hypothesizing that direct electrical stimulation would allow damaged nerve tissue to become responsive to stimuli again. After seven months of electrode therapy coupled with physical therapy, Summers could stand unassisted and can voluntarily moves his legs to a greater degree. He has also regained function related to bladder, bowels, and other internal systems. Following his lead, three other patients, paralyzed either from the chest or waist down, have received electrodes and the results are similar to those seen in Summers: returning sensation, increased motor control of leg muscles, and bodily functions regaining normalcy. More than the physical gains, the capacity to move again has positively impacted the patient’s psychology an quality of life. The study has now expanded to include more patients. While there is no indication of the spinal pulse therapy healing the original damage, it may present an avenue to by-pass the injury and allow signals from the brain to once again reach targets throughout the spinal cord.